I just read Tenth of December--really loved it, pretty devastating stuff in there. And my coworker wrote Provence, 1970! Good stuff. I bought Tenth of December right when it came out (on our walking tour of Brooklyn bookstores, no less!) and STILL haven't read it... for shame. And that is so cool that your co-worker wrote Provence, 1970! You have the best co-workers I think. Let's go on another walking tour. Great list. I've either read just about all of them or they are on my TBR list. Great minds think alike? It's up there - right along with When Women Were Birds! I think almost all of these (except a mere two) are on my list as well!! I miss so many books each year it's hard for me to think about how many good things there were that year! 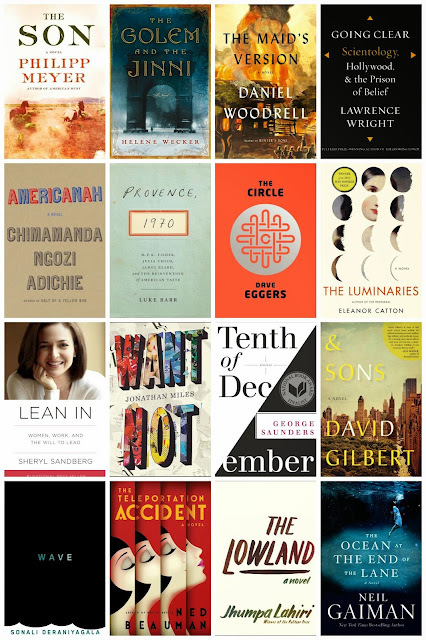 But I specially recommend Americanah for 2014. It's one of my enormous favorites of 2013. Everyone should read it. I've heard only good things about that one. I think there are only 20 some odd people in line ahead of me for it at the library... patience is a virtue? Maybe? And I can say "amen" to almost all of these. Except The Ocean at the End of the Lane. I did read that one this year. I've only read a few Gaiman books but generally hear good things about that one. I've missed dozens but we all live in hope that we will catch up one day. Happy New Year. What a unique post! No matter how much I read there are always books I miss! I am a huge Neil Gaiman fan- but I still need to read The Ocean at the End of the Lane. Can't wait to get my hands on it! I've only read a few of his (American Gods and Good Omens), but looking forward to hitting more of his backlist! Had the same panicky feel just when 2013 was about to close—I've read so many good releases of that year, but there were so many I had no choice but to miss. The Luminaries is on top of that list—and on my bedside table—especially since I fell madly in love with her first book, The Rehearsal. That said—and I know you hardly need this affirmation, haha—you read some wonderful books last year, and I'm glad our "best reads" list intersect: Joe Hill was a revelation for me, his NOS4A2 was crazy good; I'm still breathless about The Goldfinch; and Joyland was a small, perfect pocket of Stephen King's mind that I'm glad to have read. Here's to 2014, and all the books we won't be able to read by 2015, hahaha. Here's to a great year of new books and some catch up! I LOVED & Sons and I really enjoyed The Teleportation Accident (though at times that one was a bit "much", fabulous cover though). Gaiman's Ocean is high up on my TBR list as well. I've heard so many good things about all three of these. I just can't decide what to pick up next! Oh, I know that feeling. I hope you were able to find the time for this weekend, or if not over the weekend, perhaps sometime soon!